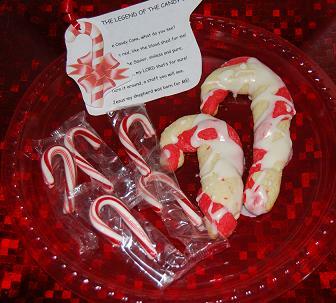 Legend of the Candy Cane ~ Cookies for Christmas Eve! Every Christmas Eve we make a very old sugar cookie recipe that belonged to my great grandmother. The original recipe calls for lard, but we always substitute butter flavored shortening. The cookie is a mildly sweet, biscuit-like cookie that literally melts in your mouth. For Candy Cane Cookies: Make 1/2 of the batch red by adding red food coloring (be sure to note any food coloring allergies before making as gifts for other children.) Our kids rolled “dough logs” from each color and twisted the dough logs to form the candy canes. The cookies and Candy Cane Legend printable (linked below) make a wonderful Christmas Eve present for neighbors, friends, and family. Cream the lard (shortening) and sugar together. Add the milk and vanilla, and then all the dry ingredients. Mix well. Set in refrigerator for at least an hour. Pat (do not roll) the dough to desired thickness on a lightly floured board. Cut into shapes. Bake in a 350 oven for 12-15 min. (do not over bake.) Decorate the cookies as desired. While the cookies are baking, the children can help make the candy cane legend tags and play with candy cane patterns. The candy cane file (linked above) is an AB pattern page. Print the file and have the children cut out the candy cane pictures at the bottom of page 1 to use in the pattern boxes on page 1. The children can draw their own candy canes in the boxes to finish each of the patterns. Older children can draw more difficult patterns, cut red and white shapes from construction paper, or cut pictures from the boxes on page 1 to glue in the blank pattern boxes on page 2. Even very young children can recognize the red/white patterns in the candy cane stripes. Explanations for the meaning of the stripes can be simplified to be age-appropriate for younger children. From our families to YOU and YOURS, we wish you a wonderful and blessed Christmas! If you would like to see more of our themes, check them out here.